Ram pickup trucks are manufactured by FCA US LLC, which it has marketed under the Ram Trucks brand since 2010. This brand includes the 1500, 2500 and 3500 series, such that the 1500 series is comprised of light-duty pickup trucks. The Ram Truck is currently in its fourth generation, which was introduced in the 2009 model year. Ram 1500 pickups are offered in nine trim levels as of the beginning of the 2015 model year, and many dealer-installed packages of the Ram 1500 are also available. The Rebel is a trim level will be added to the Ram 1500 lineup in the third quarter of 2015. This version is primarily intended for off-road use. The primary distinguishing features of the Ram 1500 Rebel deal with its suspension and rear-axle ratio. The Rebel has heavier Blistein shock absorbers and Ram air suspension, which raises the vehicle one inch higher than other trim levels of the 1500 series. All drive configurations of the Rebel have a rear-axle ratio of 3.92, which is the first time this ratio has been available on a Ram 4×4 pickup. The standard engine for the Ram 1500 has been the 3.6-liter Pentastar V6 since the 2013 model year. It generates 305 horsepower (HP) with 269 pound-feet (lb-ft) of torque. The towing capacity of this engine is 7,600 lbs. and its payload is 1,900 lbs. The fuel economy is 18 miles per gallon (MPG) in the city and 25 MPG on the highway. 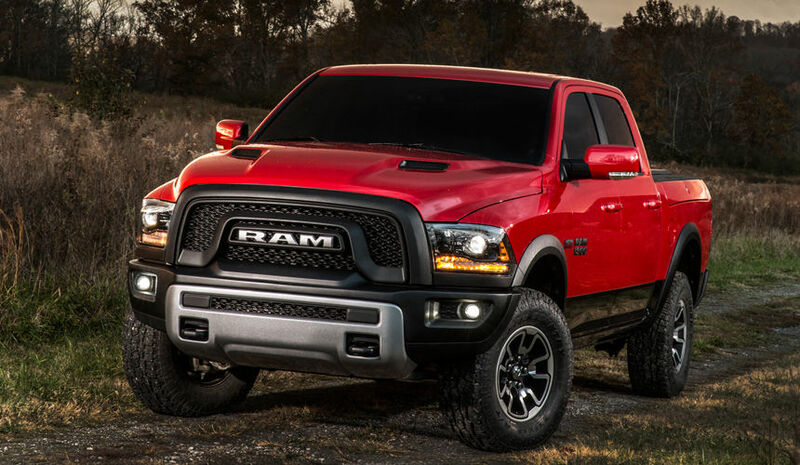 The Ram 1500 Rebel will also be offered with a 5.7-liter Hemi V8 engine, which has been available for the 1500 series since the 2013 model year. This engine generates 395 HP with 410 lb-ft of torque. The towing capacity of this engine is 10,650 lbs. and its payload is 1,820 lbs. The fuel economy is 15 miles per gallon (MPG) in the city and 22 MPG on the highway. The Ram 1500 Rebel will also be offered with a 3.0-liter EcoDiesel V6 diesel engine, which has been available for the 1500 series since the 2014 model year. It generates 240 HP with 269 lb-ft of torque. The towing capacity of this engine is 9,200 lbs. and its payload is 1,610 lbs. The fuel economy is 21 miles per gallon (MPG) in the city and 29 MPG on the highway. The drivetrain warranty for the 1500 series is a limited 5-year, 100,000-mile warranty. The standard transmission for the Ram 1500 Rebel is the TorqueFlite 8-speed automatic transmission. This transmission is designed for improved fuel efficiency and acceleration in the lower gears. It also has a system for managing the transmission fluid’s temperature, which increases the service life of the transmission. The most noticeable styling differences on the Ram 1500 Rebel are a new grille and 17-inch wheels with black pockets. This trim level also has cloth seats with black and red trim, and an embossed tread pattern. The 1500 Rebel is available with three cab styles, including a regular cab, quad cab and crew cab. A regular cab has two doors and one bench seat. A quad cab has four doors and two bench seats, although the rear seat has significantly less leg room than the front seat. A crew cab is similar to a quad cab, except that the leg room in the rear seat is equal to that in the front seat. The bed, or box, of the 1500 Rebel is available in three sizes. The short box has a length of 5 ft. 7 in., the mid box has a length of 6 ft. 4 in. and the long box has a length of 8 ft. The mid box is available on all three cab styles. The short box is only offered on the crew cab, and the long box is only offered on the regular cab.